10) Not everyone who looked at this card was instantly blinded. It took months, even years, for some people to lose their vision because of it. 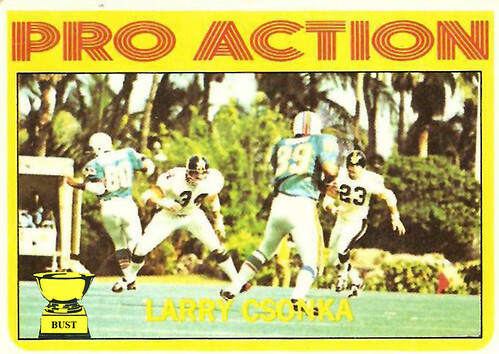 9) Larry Csonka's name is actually on the card it's just hard to read because it's in yellow type on a light background, a hallmark of quality design. 8) The Steelers were just as surprised as you are that this game was played in a Miami city park just yards from a beach. 7) Despite all the reasons not to, Topps went ahead and used that four-line font on this cardboard gem. 6) It says "Pro Action," but it's really just a full-contact 2-on-2 pickup game with Csonka and Marv Fleming against Pittsburgh's Andy Russell and Mike Wagner. 5) Nonetheless, Csonka trucked in bleachers that went two rows deep. That's his wife in the back. 4) After this exhibition game ended, the crowd was treated to three rounds of bare-chested, bareknuckle boxing between Don Shula and Chuck Noll. 3) 11-year-old Danny Marino took the stunning photo on this keepsake. 2) The game was interrupted when Csonka started chasing after a passing ice cream truck, demanding a Drumstick. 1) Nobody won this game. But anyone who paid for this card definitely lost. Larry's name is used often in the Mystery Science Theater 3000 episode "The Final Sacrifice." Rowsdower!